This is my sissie y’all. Anyways, she is known as the more RESPONSIBLE of the two of us. And less apt to say ridiculous things. BUT, every once in a while she does something to prove that we are related. So on the way back from Vegas, we stopped at Alien Fresh. Because, OF COURSE WE DID. 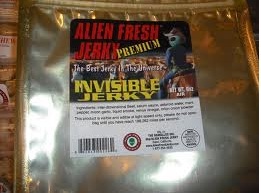 Yeah, I am NOT going to purchase an empty jerky bag that says invisible. Sissie’s BoyToy: So you’re not getting any invisible jerky? Sissie: ..? They have invisible jerky? I didn’t see that over by the tasters. Do you have to get that up front? It’s nice to know I’m not the only one saying ridiculous things. This entry was posted in Fam, Vegas. Bookmark the permalink.